I have a small amount of salmon and and a bit of cream cheese left from the weekend. It’s just enough to spread over a toasted bagel half, but I’ve got a better idea. A couple of eggs and voila: it’s an elegant supper for one. My new favorite magazine, the spring issue of Fine Cooking’s CookFresh magazine offers up a pictorial commentary on how to cook the perfect gruyere omelet. I’ve blogged about omelets in the past but thought I’d give their technique a whirl, using smoked salmon and cream cheese instead of gruyere. 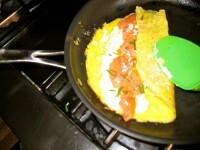 Omelets are so simple and quick to make, but they are the kind of dish that is easiest to follow in pictures. For small omelets such as this, It’s important that you are in possession of an 8-inch nonstick skillet and silicone spatula. Other savory fillings could include other grated or crumbled cheese, vegetables such as spinach, asparagus, mushrooms or onion, bacon or ham. Melt the butter in an 8-inch nonstick skillet over medium heat. In a small bowl, lightly beat the eggs, 1/8 teaspoon kosher salt, and a couple of grinds of fresh pepper until the eggs are frothy. Pour the eggs into the skillet and let them sit, undisturbed, until they begin to set around the edges, 30-60 seconds. 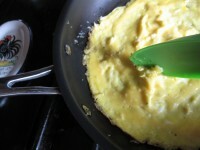 Stir the eggs quickly with a silicone spatula while shaking the pan back and forth until the eggs have set on the bottom but are still undercooked on top, 45 to 60 seconds. 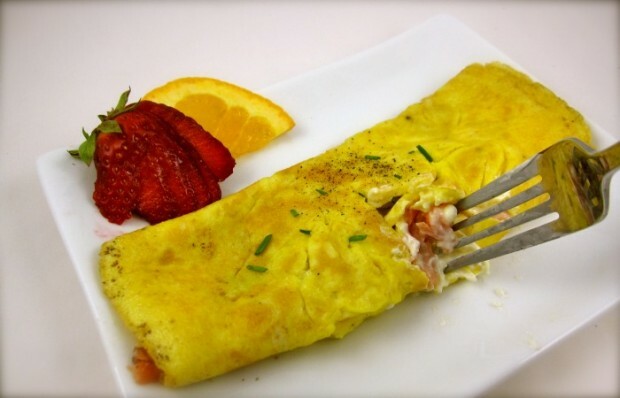 Spoon the cream cheese down the center third of the omelet and spread in a thick, 1-inch line. Place salmon on top of the line then sprinkle with chives. Let sit for a minute. Fold a third of the omelet over the cheese. Shake the unfolded third of the omelet up the side and slightly out of the pan. Invert the pan onto a plate to complete the final fold of the omelet. Serve immediately.